Okay, I may need to go back and adjust my rating for the first book in the series.I decided to try this series because I'd seen so many recommendations from friends and other posters, and I liked the first book just fine. 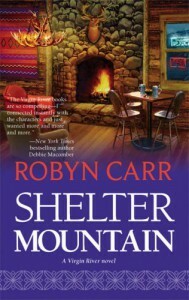 Then I read this book and realized that despite the fact that it's not my usual preferred style of romance novel, I was really into it, and really had bought into all of the characters in and around Virgin River.I'm not sure what drew me in. There are many side stories and secondary characters that you'd think would overwhelm the primary romance, but somehow it really works, and all of those secondary characters you really care about. I know I'm behind on this, but I definitely think these books (so far) are worthy reads for people who like ensemble stories.